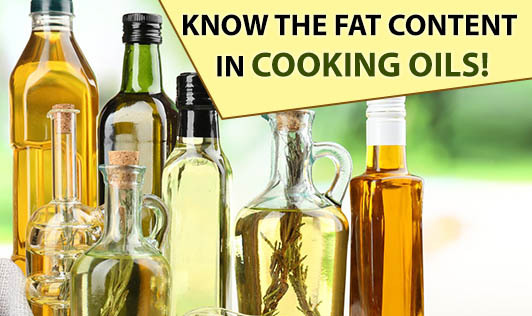 Know the Fat Content in Cooking Oils! Oils and fat (nutrient) are synonymous to each other. So when you buy cooking oil, do you have any fair idea about its fat content? Do you only go by word of mouth or want to decide yourself whether to choose it or not? Read below to get a few tips to check the fat content of your cooking oil. • Look out for total fat in grams which includes trans fat, saturated fats and polyunsaturated fats (all in grams) in the "Nutrition Facts" section. • Check for the serving size which is usually one tablespoon for oils. The amount of fat per serving that the "Nutrition Facts" claims is the amount of fat you get from one tablespoon. • Now have a look at the percent daily value on the right side of the total fat value. Percent Daily Value is a guide to the nutrients in one serving of food. For example, if the label lists 20 percent for total fat, it means that one serving provides 20 percent of the fat you need each day. The Percent Daily Values are based on a 2,000-calorie diet for healthy adults and hence insignificant for children's requirement or intake. • For a healthy adult, daily percentage of fat intake should be between 20 to 25 percent of their total daily calorie requirement. • Note that the Food and Drug Administration has not set a Daily Value for trans fat, and your health experts are right! Avoid trans fats to lower your risk of cardiovascular disease.